The inspiration for this neologism -- which mashes up rhizome + ohm -- are the writings of Gilles Deleuze and Felix Guattari, in particular the introduction to their book, A thousand plateaus , in which they articulate a vision and explication of rhizomatic systems. 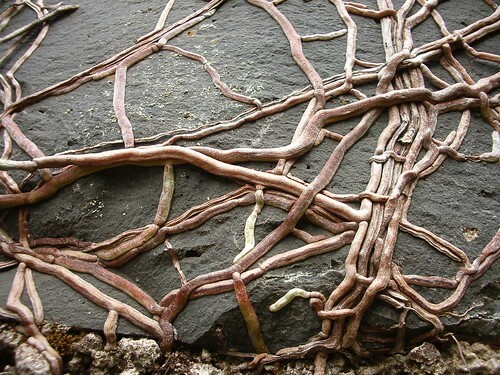 A rhizome, in botany, is a horizontal stem of a plant that sends out roots and shoots from its nodes. Principle of Asignifying Rupture: "Every rhizome contains lines of segmentarity according to which it is stratified, territorialized, organized, signified, attributed, etc., as well as lines of deterritorialization down which it constantly flees." (p.) This last point is very important, in that it complicates the very simple binary or dialectic that starts to appear and is tempting to reduce their thinking to. Delueze and Guattari go on to explicate how rhizomatic systems work, especially in contrast to arboreal systems. They provide many other great examples, such as the human brain itself: "Many people have a tree growing in their heads, but the brain itself is much more a grass than a tree." (p.15). Ultimately, I can't do justice to their explication and I would highly recommend reading the introduction on rhizomes -- and the whole book for that matter. Deleuze, Gilles and Guattari, Felix. A thousand plateaus; translation and forward by Brian Massumi. University of Minnesota Press, 1987. Rucker, Rudy. The Hacker and the Ants. Four Walls Eight Windows; Version 2.0 edition, 2002.